If you haven't guessed already, I'm a big fan of science. 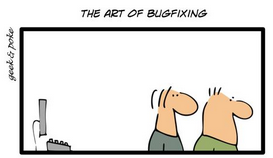 In related news, it turns out there are various names for different kinds of bugs- heisenbugs, for example. If you haven't seen it, Geek & Poke is an easy to read web comic about all things geeky - click on that link for the punchline to that panel. If you haven't guessed, it relates to Heisenberg's uncertainty principle and to the Schrödinger's paradox of the cat. It makes me wonder whether defect tracking software should have an attribute for developers to assign these various bug types. Oh, indeed I do. It's very much on the pulse of science.